What is the longest ROAD TRIP you have taken it on? Did you BUILD it or BUY it? If you start a new thread with your handle and car/year yours will be easier to find than if you reply to this thread. Bought my '65 convertible in 1980, at the peak of the Carter inflation era. It was what I call a 10 footer. From 10 feet or more away, it looked pretty good. Any closer and it really showed it's age. The guy I bought it from purchased it from the original owner but only had it for a about 3 months. He installed a new Ford factory longblock, installed new seatcovers and added (I think) '66 wire wheel covers. He decided that it was more of a project than he wanted to continue with. In 1982 I got married. We went on our honeymoon in the Mustang and I still have a nice framed picture of both of us looking out through the passenger window. Sometime after that I began to disassemble the car to refurb it. Had the engine out to do the engine compartment and all of the body parts removed. I painted the car, in pieces, in a parking lot of my Sporting Goods business, in Pasadena California. I retained the original Wimbledon White but painted it with Dupont Imron for that perpetually glossy look. I then re-assembled all those painted pieces and managed not to do any damage in the process. At this time I also added front disc brakes off of a 1969 Ford Fairlane 500. I did all this while running a business. Today I look back and wonder where I found the time and energy to do all this. None of it was in the evening or the weekends as the car was 30 miles away from where I lived. Fast forward to 1988. We moved from sunny Southern California to cloudy wet Vancouver WA. The Mustang was moved up here inside the moving van. It went directly into the then cavernous 3 car garage where it sat, virtually unused until my semi retirement 3 years ago. I wanted to make use of the car so I started volunteering it for dignitaries in local parades. It had weathered it's long rest quite well. Most of the time I kept it covered with heavy moving blankets. It was about this time that I started looking at Mustang on the internet. I was blown away how big an industry had built up around this car. Eventually I stumbled on Mustang Steve's site. Since that time I have had to mightily resist all kinds of neato improvements that were really cool. Except for subtle changes I try to keep the car original or at least to things that you could have ordered the car with from the factory. For example, the dual exhaust that I added last spring and the Autolite 4 bbl and matching factory cam that I hope to be adding soon. I told my wife, when I die, be sure to advertise the car in Germany, Sweden, England and Japan. From the age of 17 until I was about 45 I was into Model A's. Then in about 91 I got fed up with having so much money and time in old cars that just set around and sold the last one to a fellow in NY. In about 2000 I asked Jean how she felt about getting back into an old car...something to do some cruising and touring in. See if we could meet some new people. She said she was fine with that but "NO MORE MODEL As". Okay. So I asked what she wanted and right away she said she wanted a first gen Mustang Coupe. I asked why not a fastback and she said, nope, she liked the looks of the Coupe. So we decided look into getting one. Finally, in 2005 we got a round tuit and started looking. Jean asked if we could buy a finished car and I reluctantly agreed. It wasn't the bux, as I was sort of prepared to pay for a nice one. The problem was that I've seen what some folks consider "restored" and I didn't want that. Long story short, we finally agreed that I was right about most "restored" cars and went looking for a 20 footer that I could do a rolling restoration on. The the white 66 in LaSalle, CO and trailered it home. It had some worts but it ran and was pretty complete. Body didn't look too bad and it didn't seem to be a rust bucket. First winter I bought a donor 89 Lincoln TC and rebuilt the engine/trans for the 66. By spring it was mechanically good. Then the following winter it got the new TCI interior on 87 Fox GT seats. Now it's gutted again for some metal work and paint, a custom AC system and some power goodies. Hopefully when it hits the road again it will be a long term driver/cruiser. We've put nearly 16k on the odometer since the mechanical work. It's injected with an AOD, MS brake booster, and K-H front discs. It seems to be very reliable and we aren't afraid to get in it and go. It went to Dallas for the 2010 Bash and to Kalispell in 2011 (our longest road trip in it...2700 miles). That trip included a cruise to the top of Pike's Peak because certain people were "on vacation and by golly gonna see something", or words to that effect. One of the best things that has happend to me is stumbling onto this forum. If you haven't done so, you need to get to a Bash and meet the folks. Not a clinker in the bunch if you'll exempt me. We got back into an old car to meet some new friends and boy have we met the cream of the crop. Thanks again MS for providing the vehicle for that to happen. PS: Okay, how the hexx do I insert a pic? What is this, the ol' bait and switch? Easy 'nuff BB. Just look at this post. Bullet... See Hakan's post on how to post pics. Basically, use the Post Reply link right under the previous post RH lower corner insteadof the Quick post that automatically appears in white. Then you will have the picture icon in far right bottom to add a pic. Hakan explains better and has screenshots to walk you through. This is actually the second Mustang I've owned, but I don't really count my first one. It was a 1967 Fastback. I drove it twice and never got a chance to do anything to it. It was one of those situations where I had the space, but didn't have the money. That was back in 2003. Now I have the money and man, I wish I had the space. 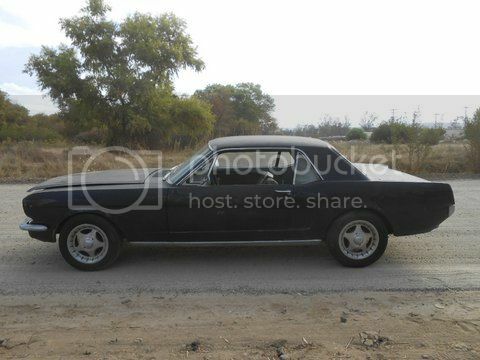 My current Mustang is a 1966 Coupe. Interestingly enough, I've never had a connection with a particular year, but I knew I wanted something in the 1965-1967 range, as 1968 and beyond is not my first choice in body style. This one came with a T5 and a 289 with the GT40P heads, which made for a nice set up on delivery day, but the 289 was not to stay. In 2001, while I was in the Air Force, my dad and I set out to start that original Mustang project. We got a 302 block for $100 took it to the machine shop, along with the setup for what would (hopefully) yield near 375 HP. This is what you see today in my '66. At the time of this post, I'm nearing 300 miles on this new engine and with the break-in period close to being complete, I am yanking the original 8 inch rear end for a Ford 9 inch with 3.91 gears to bring my Mustang to life. Finished add-ons consist of a front disc brake conversion and a Steeroid's R&P. Body, paint and interior is on the horizon. The pic of the car in the garage was within the first week of getting it. Not that neat anymore. My 302 - 12 years in the making. 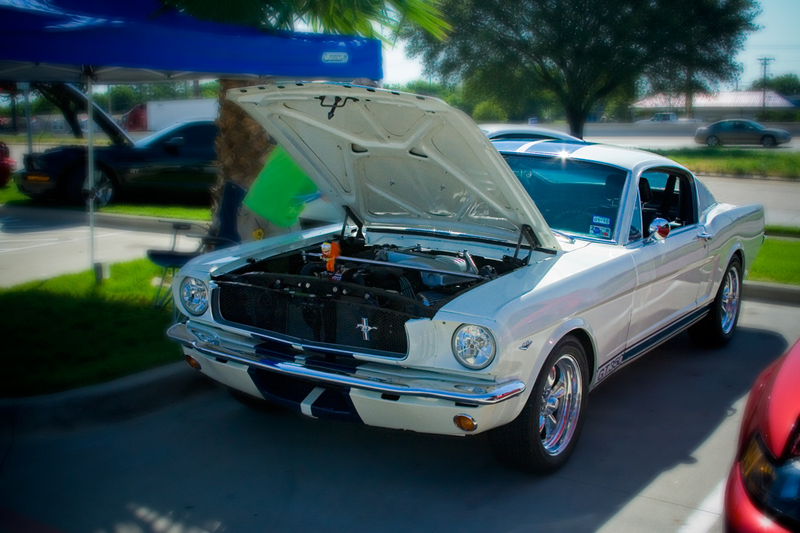 1966 Mustang Coupe w/ 302 and T5 - Wimbledon White with Red Interior...but it ain't stayin'. Had a 65 Coupe in High School back in the mid 70s. Seem to have gotten most of my original wrenching experience on that car. I can remember changing the C4 out in front of the house by driving up on the curb on one side and jacking up the outside to clear the bell. Had it for about 3 years, then had a '69 Cougar Eliminator in College. Stupidly sold it and got out of the car hobby. Fast forward 15 years - got back in to the hobby with a couple of 67s before getting my 65 fastback in 99. Have had it for 14 years and have changed out pretty much every nut and bolt. I got my first Mustang, a Vintage Burgundy T code 65 coupe 3 speed when I was 17 .It belonged to the father of a buddy of mine The dad wrecked it by smacking it into the back of our family friends 64 Fairlane 260 V8. I bought it from the insurance company for $300, scoured the junk yards for a new fender, hood, valance, bumper and a few other parts. I found them all, but they were powder blue. Yeah, not so pretty but I had no money so that's how they stayed. Drove that car all over the east coast for a year or so, replaced a few transmissions along the way and just loved that car! Drove it until the engine just gave up. Bought another Mustang black C code '65 3 speed from another friend and loved the V8! Drove that for a few years too! In the mid 70's I was hitch hiking my way around Massachusetts and got picked up by a guy who had a white C code 66 with a 4 speed and a rally pac. I offer to buy the rally pac. He said 'no deal, it goes with the car'. So I offered to buy the car. $200 later, the car was mine. Drove that car another 75,000 miles in short order, When the gas tank and rear spring shackle finally rusted through the trunk floor, my buddy and I welded up some supports and I continued to drive that car until it just was too tired. I stripped EVERYTHING off that car and still have parts from it today, including the pally pac, which is what I wanted in the first place. 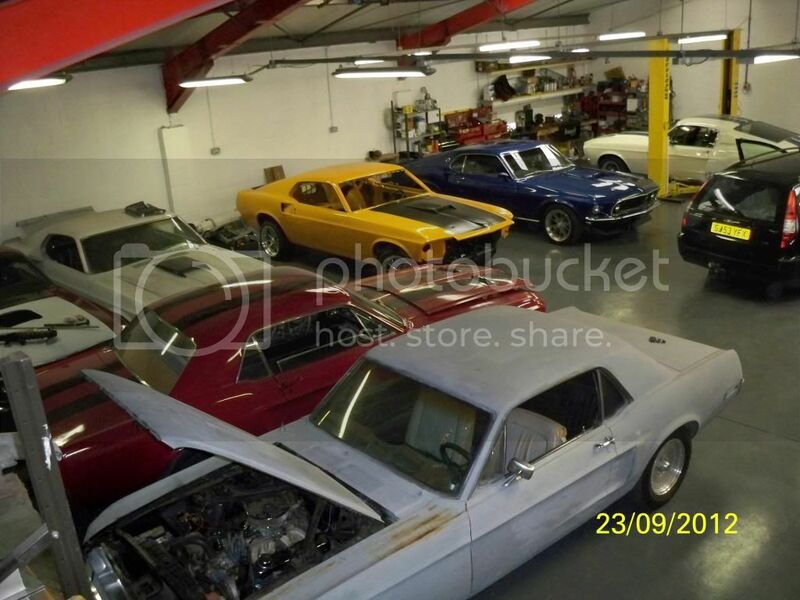 Got married and sold the disassembled pieces of the first two mustangs, but kept most of the stuff from that third one Bought a bunch of Mustang II's including a V6 Mach 1 and a V8 Cobra II. Bought a Fox body. Got divorced... bye, bye fox body. My then girlfriends father was into cars and had a small collection. A '56 Tbird, '57 Plymouth Fury, a 67 Chevy II and a 65 D code 4 speed coupe. I bought the coupe and Chevy. The coupe had been ‘restored’ in the mid 80’s and actually looked pretty good. It was a Kentucky car so it hadn’t seen the ravages of winter like cars in the northeast do. But my life was busy at that time so I dragged that car with me from place to place, rarely driving it. Most of the time it was indoors but for a few years it was left outside. Yep, some rust in the floor boards ended up appearing and the car continued to sit. Almost exactly 4 years ago SWMBO said “Are you ever going to put that car back on the road?”. Well, with encouragement like that, I had no choice but to do so. Stripped the car completely (I had the experience for that!) and discovered that the restoration done in the 80‘s was, to put it kindly , subpar. With the internet, forums like this, a few parts from MustangSteve and others I was on my way. My original intent was a simple paint job. What I ended up doing was a full restoration and a bit of mod. I was to learn what resto-mod really means. I did a good portion of the work myself but did have to farm some out. I found some interesting things along the way. The D code had been replaced with a ‘66 A code along the way but was in great shape. A cam, intake and some home porting was all it needed. A 5 speed fell into the car, along with 3.40 trac-loc rear gears. When I was done, more than 25 % of the car was not original. I finished the car last fall and registered it 25 years to the day that I bought it. I have about 800 miles on it so far and am pretty pleased with it and the ideas I’ve gotten from everyone out there in internet land. The car is a blast to drive. It turned out better than I even hoped it would. As of now, I’ve had 10 mustangs through the years out of 45 different vehicles, still have two Mustangs, the 65 and a 2004 along with an Expedition and a Solara (Her ride). She drives stick so even the Solara is a standard. The Expedition is only one of three automatics I have ever owned. I do have some non-Mustangs in my past that I’ve liked, heck, even LOVED, but I always come back to the ‘Stangs. 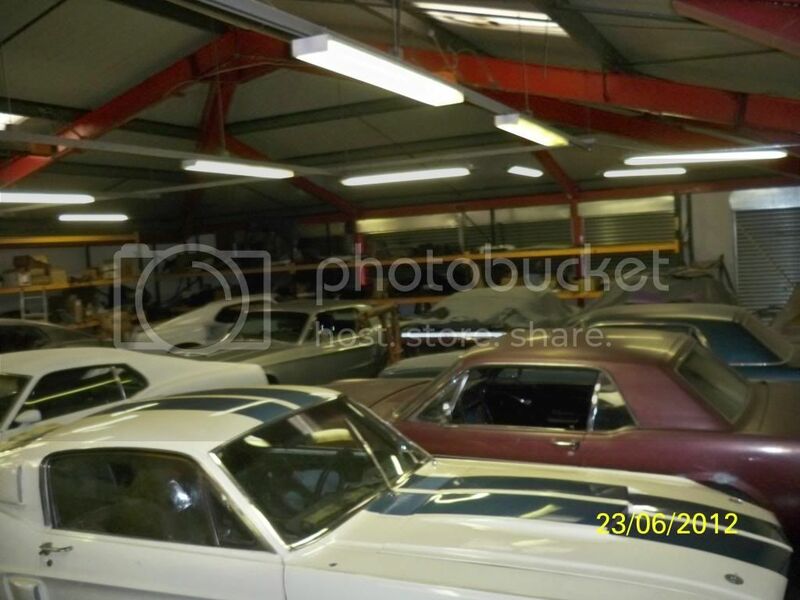 We are moving to Florida soon and SWMBO has given her blessings on a ‘vert Mustang…. I’m thinking a nice ’94 to ’98 should do the trick. Gotta be a 5 speed though! pic ...finally figured that thing out! Anyway, I fell in love with Cougars back in 1988, just after losing my first car (a '64 Fairlane 2dr post) to a Caprice Classic. Rear ended in a blizzard, on my way home from school. It broke my heart, for I had a souped-up 302 ready to replace my tired little 289, and a c4 to get rid of my Ford-O-Matic 2 speed auto. I remember looking through classifieds, depressed that there were no 'neat cars', and Dad asked "Well what about this Cougar?" In my great 17 year old wisdom, I said something like "Aw, Dad, I don't want a big luxury barge..."
But we went, and we looked, and seeing that old 67's back end revealed when the hippie who owned her opened the garage door... well. Angels sang. It started a love affair that lasts to this day. My current Cougar is not my first. I wish I had some of my old goodies; there was an original Hi-Po Dual Point distributor, 9 inch 3.25 limited slip rear and Autolite 4300 on her, but she had a whole bunch of problems too. When I went out to start her one day, the engine didn't turn over. Instead, smoke rolled out of the dash, the Windshield Wipers came on along with the dash lighting - and they were 'off'. Talk about wiring problems! So I sold her. My current ride belonged to a schoolteacher who drove it until the car had 85000 miles. Then a wealthy older friend of hers bought it to give to his teenage son for the same price she had paid - $3000. After being repainted badly from Glacier Blue to 'peeling white', the car sat in his garage for over 20 years. I saw a classified on the internet that said "1967 Cougar XR7. Never wrecked, no rust ever, $3000" I hated the Honda I was driving, and called, because it sounded too good to be true. Long story short, she's mine now, and although the original 289 succumbed to the rust and rot of not being driven for 20 years, and the paint is peeling, we've had many adventures together. Her name is Veronica, and she's got a fuel-injected 5.0 HO motor under the hood now. She's in a bit rougher shape, cosmetically, than she was on the day I got her, but she'll get better again. Here's how she looks now. GT350, you will be the talk of the Shires! Did they nip you pretty good when you imported it? I've had my 67 convert for 8 years now. It barely ran when I bought it but the body was pretty good. I added a Holley four barrel, an Edelbrock intake I got from a forum member from Stillwater, dual exhaust and headers. Over the years I've replaced all the suspension parts, converted to electronic ignition, added aluminun radiator, power disc brakes and recently most of the interior. I'm running 15 inch Torq Thrust wheels and BF Goodrich tires. My farthest trip was to a car show weekend in Crosslake, MN. (190 miles one way) I've done all the work except the seat upholstery and front end alignment myself. My brother did put in the rear springs for me as I was recovering from back surgery at that time. Hoping to start driving it again soon as we can only drive our "good" cars fo six months out of the year. It's easier to add horsepower than it is to lose weight. GT350 I'm born raised in Glasgow Scotland,Just got back from a 10 day visit,we go back 5 times a yr Normally just for Long weekends. Do you pay income tax and property tax as well? If so, I thought we were overtaxed over here! Since my '67 Mustang coupe almost got completely destroyed in fire accident in 2004 the whole effort to get the car back on the road has been called "The Phoenix Project", IIRC MustangSteve came up with the name. The complete story begins at the Ford Metuchen factory in New Jersey where the car originally was made as a candyapple red, black interior coupe with a six cylinder engine and a three speed manual transmission. It was then exported and sold as a new car in Sweden. I know very little about the car's life here in Sweden other than it's been in the Norrtälje area for quite some time before I bought it in 2000. Somewhere along the line the six cylinder engine had been swapped for a 289 V8 and a C4 auto trans together with front disc brakes from a 1968 Ford Falcon and a N-case 9 inch rear end from a 1972 Ford Mustang. Also a lot of rust repairs and bodywork had been made to the car, unfortunately not of very high quality. A paint job that probably was considered "groovy" back in the seventies was on the car when I bought it. The last owner before me had taken the car back out on the street and through the inspection after it had been resting for a pretty long while, probably several years. There was a lot of work still left to do on the car, obviously depending on to what status you wanted to build it, but that just suited me fine when I bought the car as a running project in July 2000. My initial plan was to work on the car during the long Swedish winters and enjoy it during the summers trying to avoid a larger project in the small garage I had back then. The goal was pretty much to just restore the car as it was with the upgrade parts that was already on it. This plan worked fine for the first two seasons, but then things got a little carried away when I started too many projects on the car in the fall of 2002. In June 2004 I had the car pretty much back together to be able to drive it as we were about to move to another town. But then disaster struck, I had a welding accident, the car's backseat took fire and I wasn't even in the garage when it happened. Almost the whole car and most of my garage equipment got destroyed from the fire and from what was done to put the fire out. The insurance company was very helpful after the fire, gave me a good deal and after we moved I took the car completely apart and started a complete restoration with a a lot of modifications. I am on the ninth year of the restomod work now, but during this period I've of course done a lot of other things as life have a tendency of getting in the way of the hobby. 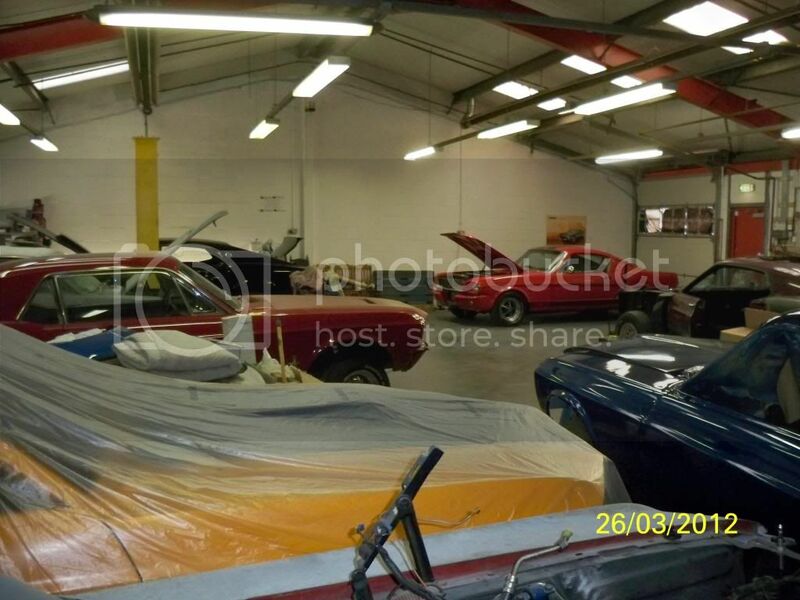 Back when I had just bought the car in 2000 we had just moved from the town where I grew up and had all my car buddies, when I turned to the internet instead there were no Swedish forums about the Mustang at that time and I just ran into this place and have stayed here ever since. I've owned my 68 coupe for 13 years. Nothing worked when I bought it ,been working on it ever is since. 289,aod,ps,PDb,ac,3:55 in rear,original headrests and convinience package. Longest trip was 5 hours to the all ford nationals in Carlisle PA. I live on Long Island NY. Still not letting me upload photos. I was able to do it on the old site. I painted it Acapulco blue and used it as daily transportation in good weather for years. 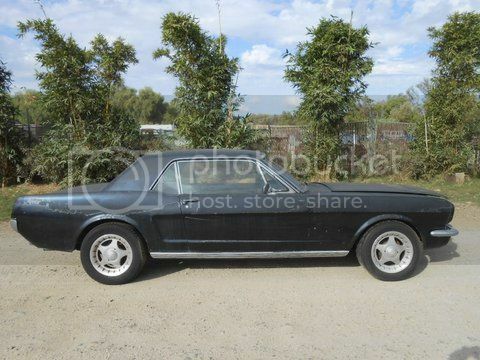 My second Stang was a good quality 68 6 cylinder coupe I bought during this period to drive as my winter car. ( It was cheap. ) It was year round vintage Mustang transportation for a couple years. As I found money to upgrade my V8 car, I transferred the cast off parts to the 6 cylinder to upgarde it too. Eventually got to the point I could not justify subjecting it to winters anymore, so I restored it and sold it off. Unfortunately at this stage I lost my job due to downsizing. I was recently married and only six months into home ownership. I made a knee jerk decision to sell my baby at auction for whatever I could get before winter storage was required. As it turned out I found a much better career in sales making far more money, but the car was gone. 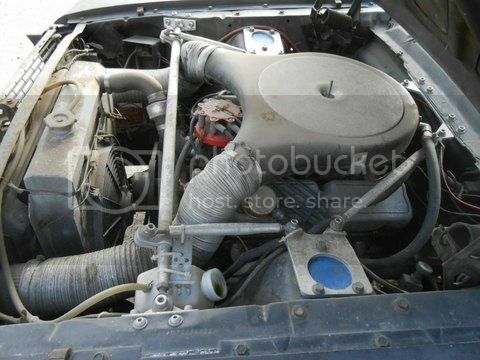 Began a search and found a 1967 V8 coupe locally that had been brought up from Texas. Complete car this time but sun baked, trashed interior, and did not run. Started over again and did a full restoration. Drove it summers for years. Even built a detached garage for it at my first house. Then came children. It barely left the garage. When the planned second kid turned out to be twins, making it double trouble, I made another knee jerk decision and sold it. Another dumb move. I remained out of the car hobby for the next 11 years. When all your kids enter the teen phase, they don't need much of your time anymore, so I started looking again 3 years ago. My wife insisted that if I did another one, it had to be a convertible this time. As luck would have it I found a rust free 68 unfinished project convertible imported from Georgia, and a rotten Canadian donor at the same time. Worked out great. Also stumbled on a Californian 68 convertible rolling shell at the same time. I bought it too, because it was too high quality to let go. The fastback is complete and very well restored by the brother of the man who owned it for the last 35 years. Unfortunately the owner died before they could finish it together. It is a shame he did not see the completed product. It is beautiful. No pics of the first few cars, long before digital, but have some of the ones currently in my possession. This site has been a real boon to me having been out of the hobby for a while. Thanks for everyones help along the way. I just found I can't post pictures because I have not posted enough yet. Will have to wait. Original owner of a 1969 Fastback. Made, not born, in Dearborn and then to White Bear Lake, Minnesota. Black Jade, 302, two barrel, 4 speed. Took it to Pennsacola when I was in Navy school. Went to New Orleans twice from Pennsacola. Three or four trips to Denver from Minnesota. Accident in 1977 took it off the road until 1985. Once road worthy out to New York for my brother's wedding. Return trip through Canada. I knew for sure I was in Canada when I was on the freeway in Hamilton I saw a guy on a motor cycle going the opposit way with a hockey stick across the handlebars. It was June. Big rebuild going on now.